The family is enjoying the fun in the sun around the pool but what a mess it can be when there are inflatable toys everywhere, wet towels and swimsuits and other pool items everywhere and could be dangerous. Here are a few ideas to pool organization to keep those items high and dry and make your pool area safe for everyone. I love PVC pipe ideas and here is a pool toy storage you can make yourself. DIY Average Joe has simple instructions to follow for your own pool toy storage. Life Creatively Organized has a list post for pool organization. I love the plastic round laundry bin for pool toys and it floats too! She also shows how she has organized her own pool area. Organize Your Stuff Now has another version of using a plastic laundry bin for pool toys. If you use a cutting machine, you will love this simple idea. Have a screened in porch that is not organized for the pool area? Check out Simply Organized and how she put together a self for all the outdoor items to be stored nicely on her porch. We live by the lake and the floats, towels. life jackets, etc. do seem overwhelming at times! We have a few storage solutions but I’m always looking for new and better ideas. Pinned. Pool cutter can be messy zone in near pool area. It can create danger for kids. I am searching best pool storage to get rid from messy toys in my backyard pool area. Really awesome pool storage ideas. 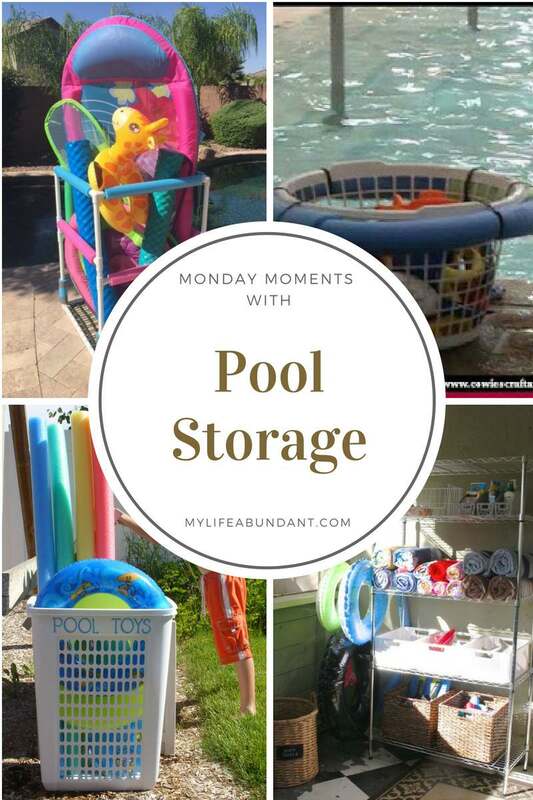 I can choose my comfortable storage for my pool.Thanks for such a great pool storage ideas.